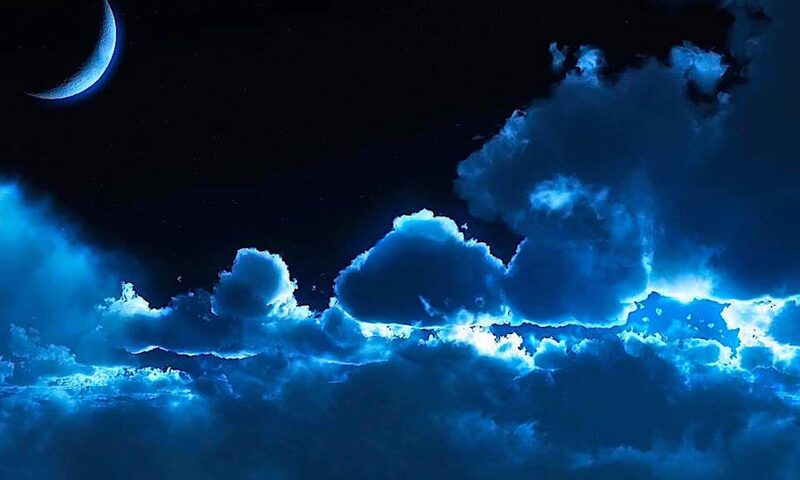 (1) Credits: Credits are assigned following the U.S. Standard Credit Conversion System. The program comprises 78 trimester credits, and consequently is equivalent to the minimum 72 semester credits for a USA regionally accredited college or university. Fifteen (15) clock hours of lectures and academic study equal one (1) Semester Credit. One Trimester Credit equals 5/6 semester credit. (2) Grading: In this program, a grade of B- or better (at least 80 out of 100 points) is required to pass each and every course in the program. 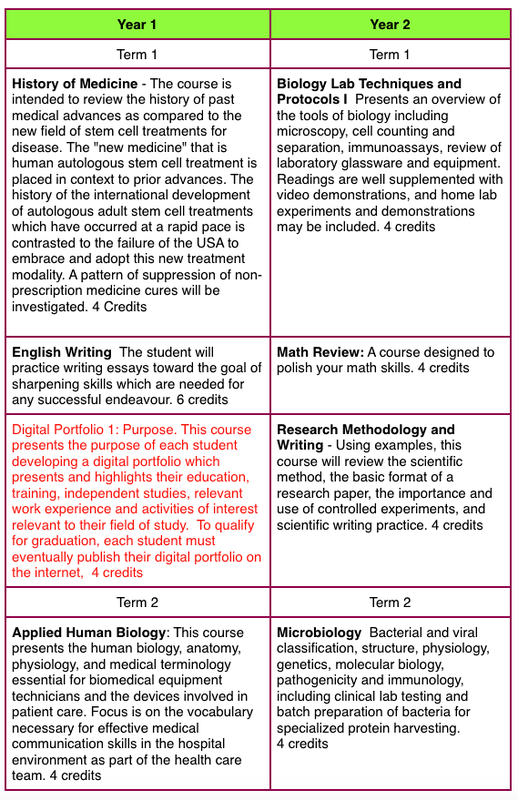 Students who do not pass each and every course cannot graduate, nor do they receive credit for any courses they have not passed. 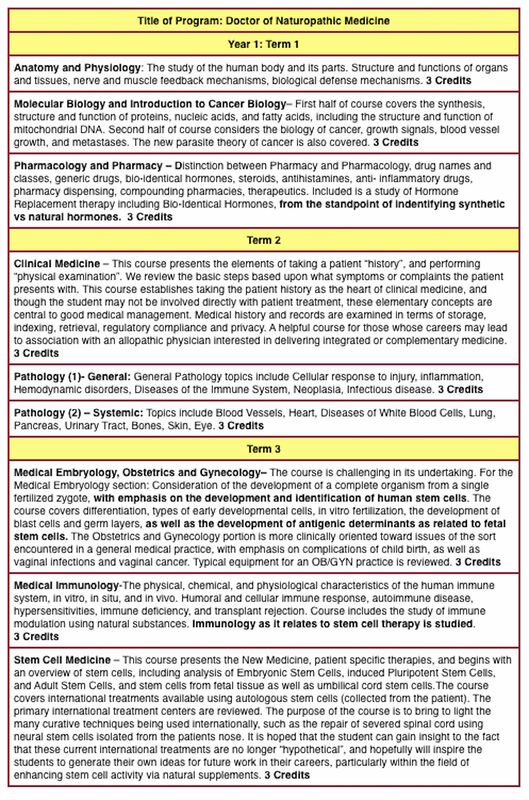 Students who receive credit for any individual course due to past education or publications, are awarded the full credit for that course and a Grade of A (95/100). 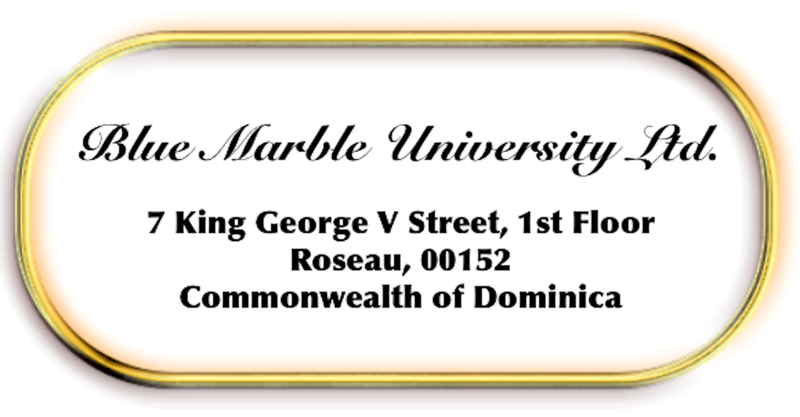 (3) The Blue Marble University Doctoral Degree is Equivalent to Regionally Accredited USA College or University in terms of credits earned: Blue Marble University is foreign (international) educational institution operating out of the Commonwealth of Dominica. Foreign education can qualify students for employment and other positions in the U.S.A., when the student’s educational credentials are approved by a professional foreign education credentials service.. Because this program is equivalent to that of a regionally accredited USA college or university, based upon the minimum trimester credits of 72, and with no more than 12 credits assigned to dissertation, it is believed that upon completion of the full program, and for a nominal fee, graduates will be able to obtain a Certificate of Equivalency from a professional foreign education credentials evaluator. Note: Our Bachelor of Science Degree is only issued upon completion of the entire 5 year program. We do not offer a B.S. 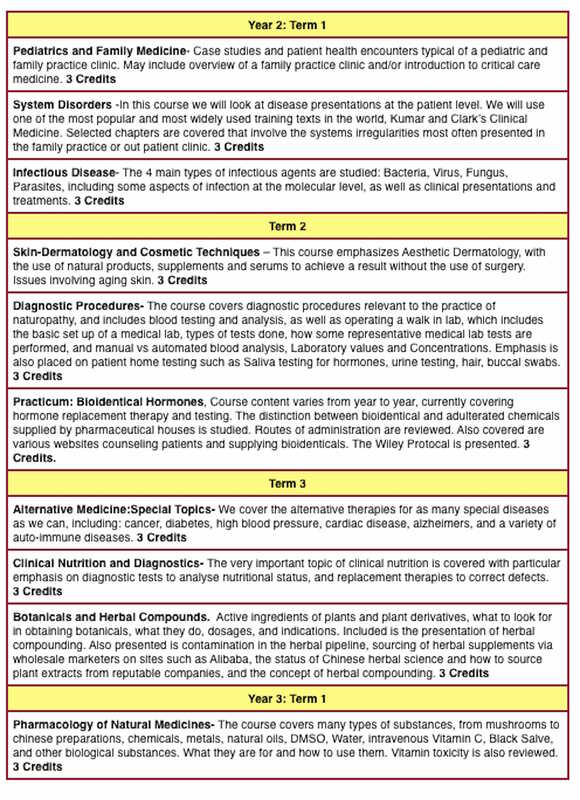 Degree except in combination with the 3 year ND degree After satisfactory completion of the first two years curriculum, the student then joins our regular naturopathic medical students, and follows the 3 year online curriculum for the ND degree that is shown below. A Note Concerning Undergraduate Degree and “Seat Time”: As we have stated before, we drop “seat time” from each and every one of our programs. 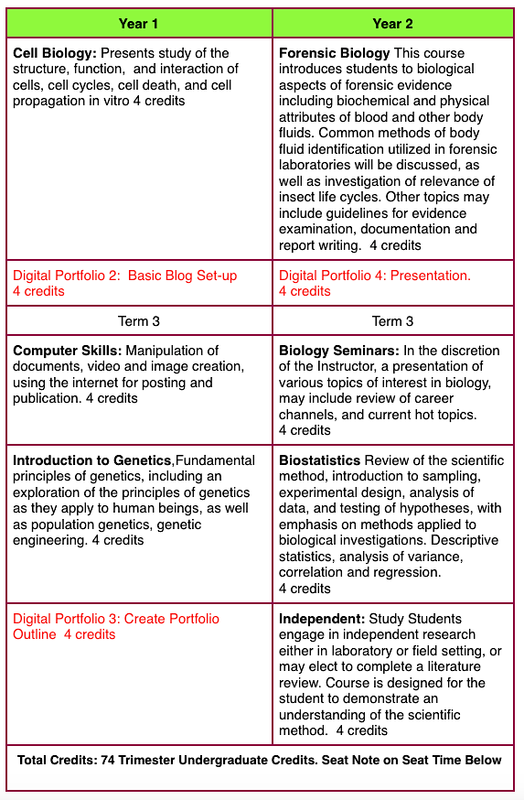 All of our students must demonstrate “Proficiency” with regard to the subject matter of their studies. Consequently, our programs are shorter.”Seat time”, which is the foundation of “accreditation” in the USA, is the old fashioned, outdated requirement that a student spend a required amount of time (usually 4 years) and/or take required general studies courses in order to receive a Bachelors Degree. Even the USA Department of Education in its “National Education Technology Plan 2010” has recognized that “seat time” has got to go. At Page 12 of the report: “One of the most basic assumptions in our education system [accreditation] is time-based or “seat-time” measures of educational attainment…. [colleges and universities should be organized] around competence rather than seat time and others that enable more flexible scheduling that fits studentsʼ individual needs rather than traditional academic periods and lockstep curriculum pacing.”We reject “seat time”. Our program is organised to achieve competence, and the undergraduate portion of this combination BS/ND degree program is designed to be the runway for entry into the 3 year online ND program.